Beltway 8 is the second loop around Houston. The entire loop, except of the ship channel bridge, includes free feeder roads which are officially designated as Beltway 8 (BW8). Most of the the main lanes are toll lanes and are designated as the Sam Houston Tollway. I will usually refer to the facility (both feeders and mainlanes) as BW8. BW8 saw a tremendous amount of activity in the late 1980's and all of the 1990's. Nearly all of the roadway was built during that period, including five 5-level stacks. The current activity on BW8 is on the north segment between I45N and US59 north. 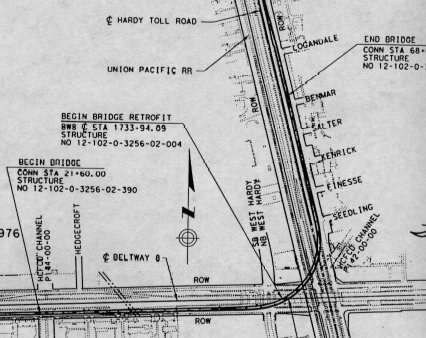 This section of BW8 was the first to be built as a feeder road facility in the late 1960's when Intercontinental Airport (now Bush Intercontinental Airport) was opened. Today it is the only freeway section of BW8. There are three contracts underway as of July 2000. The first project will build the four remaining direct connectors at the I45/BW8 interchange to complete the 5-level stack. The second project will add one direct connector at the BW8/Hardy Toll Road interchange, which presently has no direct connectors. The third project will extend the freeway over US 59 and add one direct connector at that interchange. 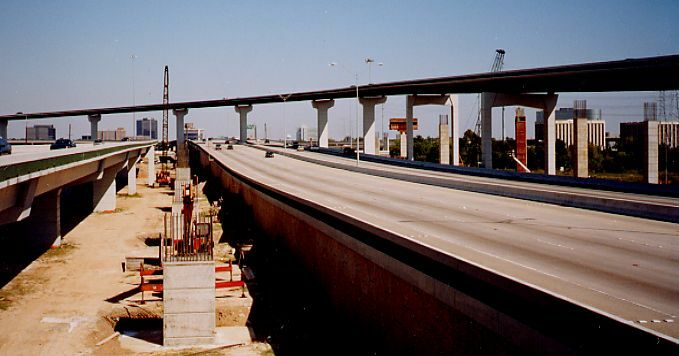 Construction of direct connector ramps at the BW8/IH-45 interchange, October 2000. This view looks east, showing piers for the connector from eastbound BW8 to southbound IH-45. Construction of direct connector ramps at the BW8/IH-45 interchange, October 2000. This view looks east, showing piers for the connector from northbound IH-45 to westbound BW8. This schematic view shows the planned 5-level stack at BW8 and US 59. In 2001, the BW8 main lanes and 1 direct connector are under construction. Construction of the direct connector at the BW8/US59 interchange, October 2000. This view looks northeast across US59, showing piers for the connector from eastbound BW8 to northbound US59. Photo taken June 2000. These are some of the piers east of US 59. This will form part of the long bridge that extends about 1 mile east of 59. These are the piers on the west side of US59. The eastbound BW8 feeder is in the foreground, and US 59 can be seen in the background. 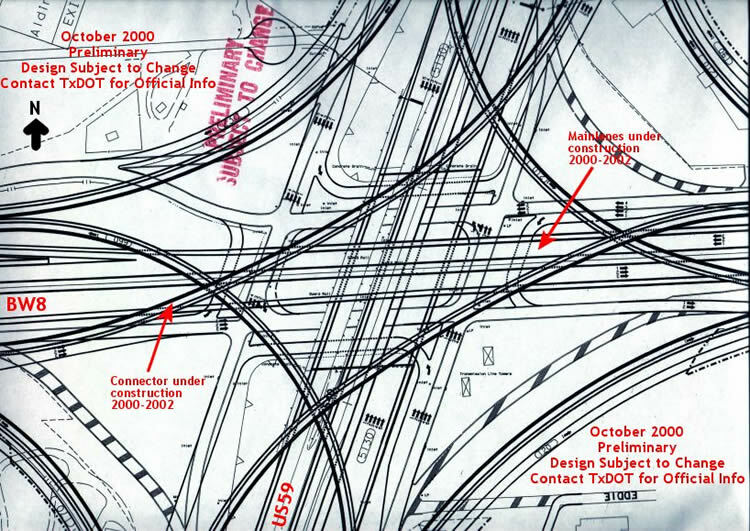 As of June 2000, no significant work had been done on the direct connector from EB BW8 to NB US 59. (high resolution 94k) On May 20, 2001, the piers along the Hardy Toll Road were in place. 20-May-2001.